Insurance Regulatory Development Authority (IRDA) has recently published Annual Report 2017-18. This report contains important information about the claim settlement ratio of insurance companies. Based on IRDA Annual report 2017-18, I have listed down 10 Best Life Insurance Company in India. The listing of a life insurance company is done purely based on IRDA claim settlement ratio 2017-18. It is highly recommended to check the claim settlement ratio before buying any life insurance policy. 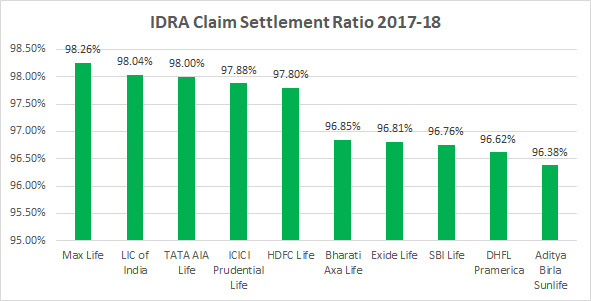 So, let’s try to look at claim settlement ratio and other important data given in the Annual report of IRDA 2017-18. A claim settlement ratio means a number of claims settled or paid by the insurance company on the claim/death of the policyholder. This claim settlement ratio is calculated as the total number of claim settled against the total number of claim received. Suppose, a Life insurance company has received 10000 claims and 9910 claims are settled by the company claim settlement ratio of a company would be 99.10%. The claim settlement ratio (CSR) plays a crucial role in determining trustworthiness/reliability of the company. High CSR means trustworthy and reliable insurance company. On the other hand, low ratio indicates that the insurance company is less reliable when it comes to CSR. 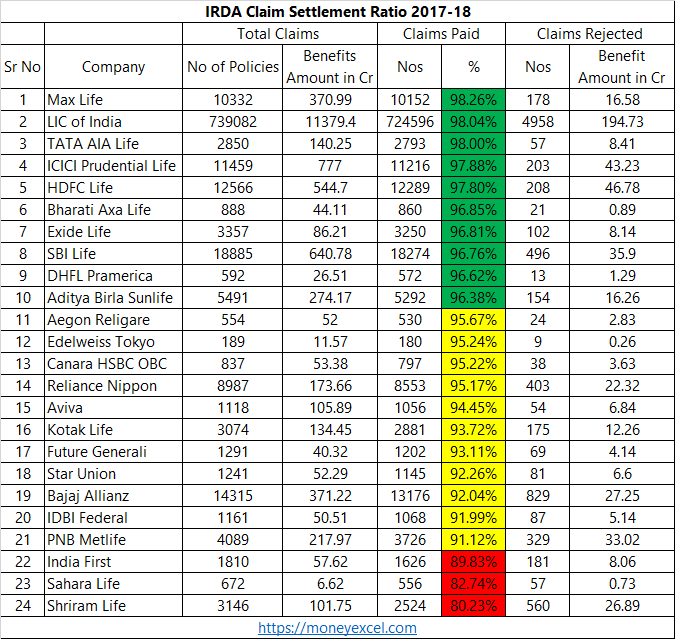 Below is the IRDA Claim Settlement Ratio 2017-18 or up to 31st March 2018. For better understanding I have used color coding. From the above table, you must have noticed that out of 24 different life insurance company 10 companies are in green with CSR of 96% and above, 11 companies are in yellow with settlement ratio in range for 90% to 96%. 3 companies are in red with a ratio below 90%. If we do an analysis of claim rejection amount. LIC is topping the chart with rejection amount of 194.73 Cr. However, a total number of policies for which claim made is also high in case of LIC. In the case of Max Life, rejection amount is 16.58 Cr against settlement amount of 354.41 Cr. This indirectly means that Max Life has settled a claim for more probably small polices. However, the total amount for rejection is also more. Based on the claim settlement ratio list of 10 Best Life Insurance Company for 2019 is given below. Max Life is Topping the chart with highest claim settlement ratio. However, if you see compare the total number of policies it is very less 1.21% of total policies. Numbers of claims received and paid by LIC are highest compared to all other insurance company. This makes LIC is most popular and trustworthy insurance company of India. From above CSR detail, we cannot say anything about product type and return given by product. This claim settlement ratio does not give insight about claim paid for types of insurance policies like term plan, endowment plan etc. You cannot rely entirely on Claim Settlement Ratio for the section of the Insurance company or Insurance product. Note – Section 45 of Insurance act says that No policy of life insurance shall be called into question on any ground whatsoever after the expiry of three years from the date of the policy. If you are planning to buy life insurance for protection you should go for term insurance. You should use claim settlement ratio as one of the factors while buying an insurance policy. CSR should not be the only factor for deciding Life Insurance Company. Compare at least last three years CSR to get a fair idea about the insurance company. Apart from CSR, you should also look at average claim settlement time. It should be less than or equal to 30 days. Compare all other features of the insurance policy before buying. Never allow any insurance agent or representative to fill the application form for insurance. Disclose all reverent information asked in the form. Hope details of IRDA claim settlement ratio will be useful to you. Do share your queries in the comment section. You can go through IRDA Annual Report 2017-18 from IRDA Website – Annual Report Section.